My name is Laurie Moorhead, and I live in San Diego (follow me on Instagram and Flickr) I grew up in the San Francisco Bay Area (San Mateo), went to college at UC Santa Barbara and UC Berkeley (BA in Social Welfare, 1976), lived in the LA area for a few years (Long Beach and Palos Verdes) and then moved to San Diego where I have happily lived since late 1982. I guess the real start of my current artistic life would be in about 2004 my younger daughter was attending an art summer camp at the San Diego Zoo. She noticed that there were a few adults in the camp and told me she wanted me to join her the next year. I signed up for this all day, week long camp and figured I wouldn’t really enjoy spending that much time drawing at the zoo so I scheduled a couple of appointments during the week to give me an excuse to leave. By the end of the first day I had canceled as many as I could because I was hooked! At this point I was just drawing from photographs and continued with this for a couple of years until I started taking classes at the La Jolla Athenaeum in 2008. I was taking a variety of classes in different medium (colored pencil, oil pastel, watercolor, collage, etc.) and really started to feel the limitations of my drawing ability so signed up for a 5 week, 4 day a week, 6 hours a day, freehand drawing class at our local community college. This was life changing! I went from only being able to draw from a 2D image to being able to draw inanimate objects from life. At that point I swore I would never draw people but gradually I ventured into that subject as well and ended up taking two semesters of Life Drawing. I’ve continued taking serious art classes off and on at the community college (Oil painting, 2D Design, Life Drawing) while taking shorter, less serious classes at the Athenaeum. 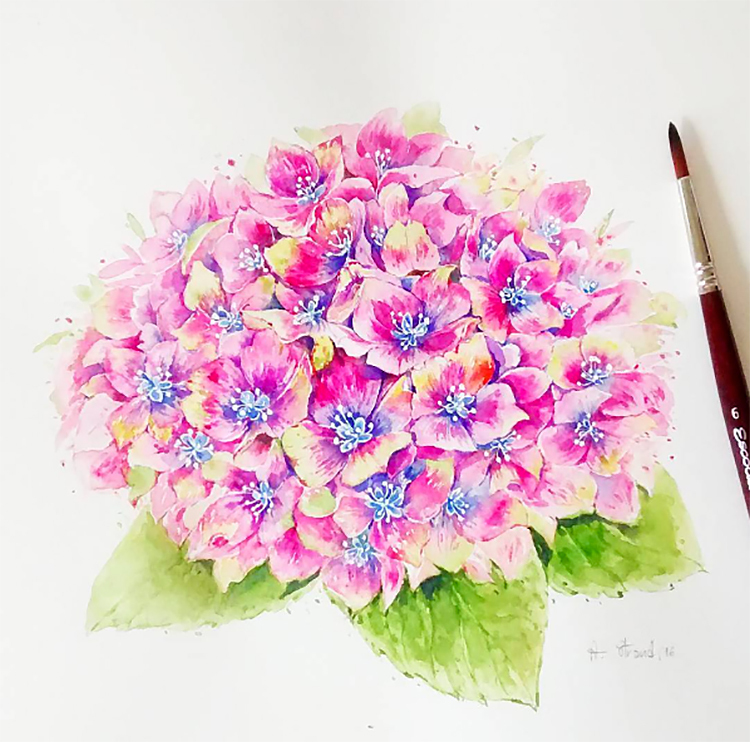 I eventually stumbled onto Jane LaFazio who teaches a very simple sketching with ink and watercolor technique that I adore and is really the foundation of what I do. Along the way I also got hooked on book arts, making my own books and telling my life story through sketch, mixed media, collage and whatever strikes me. I have gotten very involved in our local group, San Diego Book Arts, and have been participating in a collaborative art project with 40 artists each creating an original piece in response to a series of haiku about the moon written by a local poet, Diane Gage. We hope to have our full exhibit of these pieces and the artist books we each made from printed copies of the originals opening at a local gallery or library sometime in 2016. Most recently I set myself a goal of A Sketch A Day which I did faithfully for 30 days. This caused me to make a major change to the way I sketch. Prior to this self-inflicted challenge, I always sketched with a pencil first, working and reworking the sketch until I was happy, then inked it with a Pitt Pen, erased the extra pencil marks and then watercolored the sketch. When I started committing to a sketch a day I realized I didn’t have enough time for pencil sketches and started sketching straight to ink or watercolor. This was an amazing change for me and I think that I have gotten a lot better in the few months that I have been practicing this method. My confidence has definitely improved! Since completing my 30 day challenge I don’t always sketch everyday but I find myself missing it and craving it more and more so I have definitely instilled this habit in myself which was what I wanted. My main sketching materials are simple travel watercolor palettes that I have made from tube watercolors or gouache, a Pitt Pen (I like XS or S point), and Niji water brushes (I have small, medium, large and flat tips and I use them all). Lately I have been using my own hand made sketch books. In order to make sure that I always have sketching materials available wherever I am, I made myself a purse sized sketch kit that consists of a two mini palettes made from recycled lipgloss palettes and filled with tube watercolors (Winsor & Newton, a Niji water brush (small tip), a Pitt Pen (black, XS), a water soluble graphite pencil and a Hand Book brand 3.5” x 5.5” sketchbook (see photo). I am happily married to a wonderful man who supports my art and builds me tools that I need. He is a dear and I am blessed! I also have two daughters, 19 and 26, who are both artists in their own rights but would deny that. Professionally I am retired but when I work or volunteer I tend toward accounting and business organization. I love having the two areas of my life, art and business. Sometimes they merge but mostly they are separate. I have no interest in doing anything professional with my art, this is my pleasure and I want to keep it that way. However, I do love having people look at it and nothing is more satisfying that hearing kind words about what I am doing. GUEST DOODLEWASH: Featured Artists On The #NatureDoodlewash Hike! Thank you for sharing your beautiful art and story with us Laurie, I’m following you on IG. Thank you Charlie. Beautiful work and a lot like me, with accounting on the work side. I’d love to escape tax season once and for all and make beautiful art to help support the family instead! I’m only on WordPress, but enjoyed seeing your artwork and reading about your process. Have a wonderful 2016! Thanks for the intro, Charlie! Laurie thanks for sharing your work. I’m so inspired to really work on my art next year. Your art work is very nice. Happy Holidays! Those are awesome sketches, Laura. Thanks for sharing, buddy! I agree with you about the challenges of sketching everyday. I have been able to do it for the most part this entire year. Will be following on IG! Laurie, I love your creative journey and where you are today. You create beautiful artwork, so much love in what you do. Thank you for sharing! Laurie, love hearing your story and seeing your beautiful work. It’s great that you are still growing. I need to get back to more regular drawing. I kno it makes such a difference. I love the pen lines in your sketches.